If there’s one thing that Receptra Naturals excels at its transparency, and in the world of cannabis, that’s priceless. But what really sets this brand apart from the rest of the industry is their decision to exclusively use the flower from the hemp plant for their various concoctions. The company offers 100% American grown hemp that is straight from family farms across Colorado. Receptra Naturals is a company that lets its content and customers speak on behalf of the brand. Happy customers report quality products that are highly effective and help to improve their lives by providing relief from anxiety and pain, among other ailments. Many have shared stories of improved workouts, reduction in achiness, and peak mental clarity after using Receptra Naturals products. If you are seeking out high-quality, effective products that offer targeted relief, then this is definitely a brand worth checking out. Let’s take a look at what they are all about and what they have to offer. Receptra Naturals is a company based in Colorado that works together with family owned organic hemp farms to produce full-spectrum CBD products that are available in several strengths. Their branding efforts are focused on attracting athletes through MMA partnerships; however, they cater to everyone and are known for producing well-made products that are quite reasonably priced. With a line of Active Lifestyle products that are tailored specifically to fitness and athlete professionals, Receptra Naturals is one of the very few companies that is focused on developing products targeted to the athletic community. The increasing demand for CBD-rich hemp products should come as no surprise considering the never-ending news stories of late that highlight professional athletes who are promoting their use of cannabinoids, particularly CBD. 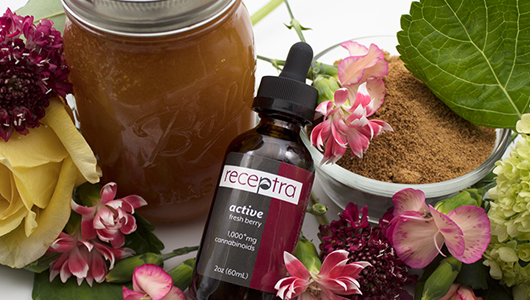 Receptra Naturals is meeting this demand with their line of Active Lifestyle products that feature their targeted topical and three hemp extracts; Active, Elite, and Pro. Each of these has a different strength and a unique blend of several essential fatty oils that include grapeseed, MCT, and avocado oils, among other ingredients. Receptra Naturals strictly uses 100% organic growing practices. Each plant is carefully hand-selected to ensure that only the highest-quality of hemp is used in their products. All of their hemp oil is extracted from premium hemp flower to ensure that a full spectrum of the hemp’s cannabinoids is utilized without using the plant’s stem, seeds, or stalk – only the good stuff. Third-party tested: Each batch of the Receptra Naturals hemp oil is submitted for third-party testing. They share all of their testing results with customers to ensure full transparency in their products and processes. This allows them to guarantee consistent, pure hemp extracts. Fully licensed extraction facility: All of their products are extracted in their fully licensed extraction facility, so you always know what’s in the bottle. During each production step, the lab technicians take extra care to create contaminant free and safe products. Whole plant floral extracts: All of the products are extracted from premium hemp flower. They ensure full-spectrum hemp cannabinoid products that ensure that the body will benefit from the entourage of cannabinoids. Return policy: If you aren’t happy with your product you can return it within 30 days for a full refund. They also claim to resolve close to 100% of their customer issues within 48 hours. Transparency: The Receptra Naturals site has a section that allows you to trace your product to its original source. This is where you can find the Certificate of Analysis for your specific product. All you need to do is enter the code from the green label on the product where prompted – under the testing tab on the website. If you’ve seen some of our various other reviews, then you might have realized by now that we are rather critical when it comes to brand websites. While the Receptra website isn’t the worst we’ve seen, it’s not one of the best either. For starters, there is no “About” section, so we don’t know much about who started the company, how it started, their mission, vision or who is running things. We like to know what motivates a brand, why they do what they do, and who is working behind the scenes, and this is certainly an aspect where Receptra Naturals could make improvements. While the company offers outstanding transparency in terms of their products and where they come from, we would like to see an improvement on their website when it comes to the finer details. I have tried both the Elite and Pro fresh berry from the Active Lifestyle line – they’re great for anyone who wants to take their mental and physical activity to a higher level. They have a strong musky scent and smell more like mint than berry – covering up that unusual CBD oil smell that is unique to all CBD oils. The taste mimics the scent and is rather refreshing. This is perfect for anyone who suffers from mental stress, muscle fatigue or simply demands more from their body and mind. 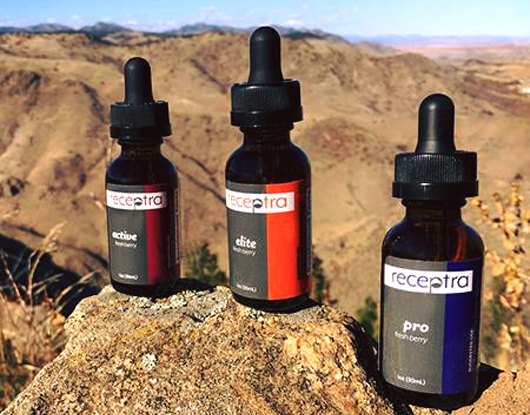 Receptra Naturals is sure to give you that edge that you have been looking for. Health and wellness extracts: The health and wellness pure hemp CBD oils are available in two concentrations; Prime & Plus. These are ideal for anyone who is new to CBD, as well as those who depend on it for advanced health and wellness needs. Prime is available as a quantity of 22mg per dropper and Plus is sold as 44 mg per dropper. Active lifestyle extracts: Available in three concentrations – Active, Elite, and Pro – these are a unique blend of all-natural performance enhancing and recovery-enhancing ingredients that have been formulated to keep you feeling energized and focused throughout the day. Active is available in a quantity of 15mg per dropper, Elite as 30mg per dropper, and Pro as 60 mg per dropper. 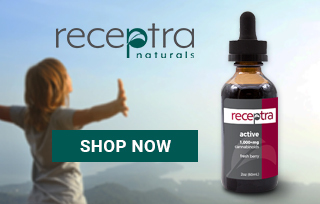 Topicals: Receptra Naturals has on offer two distinct topical products, and each of these is formulated with all-natural ingredients that are blended together with their pure CBD hemp-oil. Whether you are looking to fend off muscle or joint irritation or restore your youthful radiance and glow, you will find a topical product to suit your needs. The body butter is available in a quantity of 400mg of CBD per container and will naturally moisturize and restore the skin’s youthful look and feel. The targeted topical is for muscle and joint irritation and is available in 400mg CBD per 1.25 oz. Receptra pet: The Receptra pet products have been specially formulated for your pets to ensure a safe, all-natural, health and wellness solution. It’s available as a CBD oil in either 500mg per bottle or 750 mg per bottle. These products are great for calming down anxious pets, aiding their digestive tracts, maintaining hip and joint mobility, and supporting the immune system. Receptra lip balm: A cannabinoid-rich treatment for the sensitive skin on your lips, expect to naturally revitalize your lips with natural ingredients when using this product. Other ingredients include; Beeswax, shorea butter, and Vitamin E oil. There are 15mg of cannabinoids in a lip balm. Health and wellness extracts: Prices range from $39.95 to $199.95 depending on size and potency. Active lifestyle extracts: Prices range from $24.95 to $249.95 depending on your selection of products, size, and potency. Topicals: A 3.25 oz container of body butter will cost you $44.95, and expect to pay between $39.95 and $68.95 for one of the targeted topical products. Receptra pet: The pet products will cost between $44.95 and $67.95 depending on your selection. Receptra lip balm: A 15 oz lip balm will cost you $5.95. Selling 100% organic, family-farmed, Colorado-grown hemp, Receptra Naturals really is a breath of fresh air. Since they use only the premium parts of the hemp plant in all extractions, you can expect only the highest quality of products. 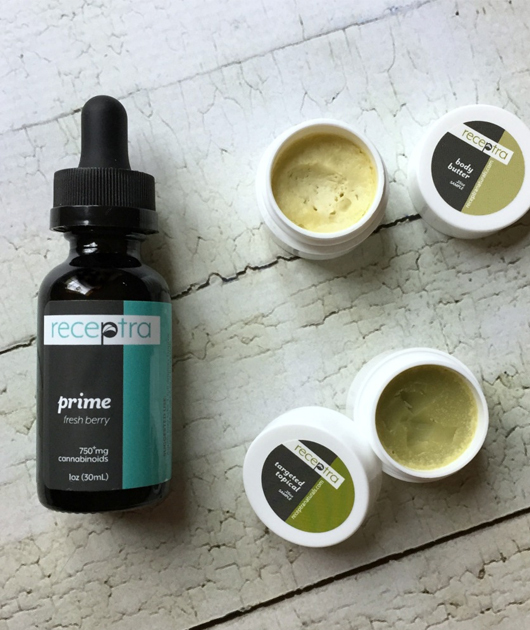 In essence, Receptra is perfect for anyone who is looking for safe and unique CBD products that are not only full of good vibes but grown right here in the United States. My work life is pretty intense, usually i am working overtime which is so exhausting. Receptra Naturals CBD Oil has helped me to beat the stress and start each day with a smile. My skin loves the Receptra body butter, the CBD is extremely nourishing, and after use I feel like a new women! I would hate to give my dog any artificial medicines, so it makes me happy to know the Pet Plus oil is all natural. My pet dog suffered from poor digestion. Apart from improving his diet, I introduced probiotics and Receptra CBD pet products in his diet to aid his digestive tract. To my utter surprise, I can see and tell the difference in my pet’s digestion and energy levels within 7 days of using probiotics and CBD. Wow…love this body butter! Its super hydrating, I’ve even convinced some of my friends to buy some. Addisyn from Ashburn just bough! Edward from Ashburn just bough! Myra from Ashburn just bough!